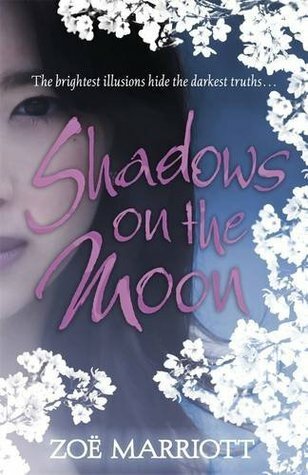 Trained in the magical art of shadow-weaving, sixteen-year-old Suzume is able to re-create herself in any form — a fabulous gift for a girl desperate to escape her past. But who is she really? Is she a girl of noble birth living under the tyranny of her mother’s new husband, Lord Terayama? Or a lowly drudge scraping a living in the ashes of Terayama’s kitchens? Or is she Yue, the most beautiful courtesan in the Moonlit Lands? Whatever her true identity, Suzume is destined to use her skills to steal the heart of a prince in a revenge plot to destroy Terayama. And nothing will stop her, not even the one true aspect of her life- her love for a fellow shadow-weaver. This book definitely lives up to my expectations of it. I probably loved this book more than I had expected to and even more so than I logically would have. But the fact is, sometimes you just love a book for no other reason aside from the fact that you love it. Following Suzume through her intense journey can be trying at moments and quite overwhelming. Sometimes you wish you could shake the poor girl out of her self-sacrificial suffering and sometimes you can't help but to just feel. You watch as Suzume loses her most beloved family members at the beginning of the story and then goes on "not quite living" with her mother and new step-father, both of whom are content to move on with their lives while poor Suzume continues to suffer a survivor's guilt of turmoil, being unable to express her feelings as she wishes. And even as the days just continue to drag on for Suzume, more and more events continue to occur, causing this story to seem as if it both drags on and rushes by at an alarming pace (if that even makes sense). You watch as she becomes the lowly drudge named Rin and then continue to watch in wonder as she becomes the mystical, mysterious, and enticing Yue. Suzume is certainly a very different kind of YA heroine, and could almost be her own antagonist if she allowed herself to fall off that deep end. From the moment she loses her family, watching her father and her beloved cousin slaughtered before her and then witnessing her mother moving on with her life, she stops being a happy-go-lucky, innocent girl. In fact, she readily becomes quite angry and vengeful and a lot of her actions can be quite questionable on lots of moral levels. There are a lot of layers to this girl that got peeled back slowly as she continued to develop along her stories. This is definitely an attractive fairy tale-like retelling making use of cultural elements and magical elements to weave such a melancholic trial for Suzume to travel. The writing is solid and excellent, the imagery is vivid and beautiful, and the magical elements are incorporated so naturally that I never once questioned Suzume's use of it nor her ease of use of this shadow-weaving. The skill of shadow-weaving is an interesting magic that I'm intrigued to explore if the author chooses to include it in another novel. The romance was cute in some ways, but also angsty in others, and fortunately it is more than simply a romantic fairy tale that propels this story forward. The main conflict seems to be an inner struggle of Suzume's warring emotions and what she believes to be true of her life. In truth, I'm sure this book will take quite a bit of patience to get through because it seems to meander quite a bit, even if it never really strays from the main story line. Kano Akira is wonderful and I loved her friendship with Suzume--or Yue, if we stick with the third identity that our heroine takes up. Otieno is swoon-worthy, though I feel like he was downplayed more than I appreciated. Terayama and Suzume's mother deserve each other and I hope they get what other fate they will soon deserve. The culture was illustrated in a lovely way and the characters were excellently created. This short review doesn't really hit on anything useful to other readers, I'm sure. In a simple word, I truly just loved this book despite some random quibbles that I will willingly ignore, because, in the end, I loved it just because.